Before you start looking for a realtor, you need to understand what representation actually is. If you want to sell your home, then you may be on the lookout for a specialized seller’s agent. If, on the other hand, you want to buy a property, then you need a buyer’s agent. Whether you choose a buyer’s or seller’s agent, they have a legal duty to represent you as soon as you sign a contract. Make sure you find out whether anyone can personally recommend a realtor. However, don’t let your decision weigh solely on their opinion. Take the time do a lot of research. Your realtor should also be experienced in your needs. If you are hoping to buy a penthouse, for instance, you shouldn’t go to a realtor that focuses in suburbia. Next, make sure you speak first to potential realtors before you hire them. Make sure that you ask things such as how they will represent you and work for you, how much they cost, what their experience is and more. You also need to talk about your expectations. It is important that they understand your needs. Finally, you need to actually like your realtor. The reality is that you will struggle to trust someone who you don’t like. The last thing is that you need to find someone that is very experienced. There is something to be said for working with new people and giving them a chance, but buying or selling homes are incredibly important financial decisions and you need someone that actually knows what they are doing. A number of things should be avoided as well. Don’t work with someone with whom you are friends or to whom you are related. This would represent a huge conflict of interest and it could also mean that you struggle to be honest with each other. Furthermore, if you find that the result is not entirely to your satisfaction, you could place your relationship in jeopardy. You should also not work with a realtor that is already representing the other side as well. Don’t be afraid to go to a new realtor if you’re not happy with the service. If you find you do want to leave your current realtor, do so respectfully. Don’t tell realtors that you will definitely work with them unless you are sure yourself. Simply be honest with your realtor and tell them what stage of the process you are at yourself. Honesty is the best policy and you expect honesty from them, so you need to return that courtesy. In most cases, if you want to sell your property, your agent will require you to sign an exclusivity agreement. It is a very normal thing to do but you still have most of the same rights. If, for instance, you feel that the representation you are receiving is not proper, you able to terminate the contract. The contract stops you from enlisting the services of a different agent at the same time, but is otherwise non-restrictive. If you want to buy a property, on the other hand, you don’t have to sign such a contract. However, there are now more and more realtors who do request it. Finally, you must work out just how your realtor makes their money. Realtors can earn their money in a variety of different ways. Although there are a few realtors who charge a flat fee, the majority of them will work on commission. Before you agree to work with a realtor, therefore, you must understand which one of the two constructions they work with. One of Central Florida’s number one u-pick blueberry farms, Ever After Farms, shall be having a Wedding Barn Grand Opening and Bridal Expo on December 2, 2017 from 10AM to 1PM. Found just off of I-95 in the picturesque and peaceful farming community of Mims, Ever After Farms has already been a well known collect your own blueberry farm for many years. After the blueberry period ended in June of this year, significant updates were made to enrich the blueberry choosing experience as well as host weddings and on Dec 2nd, engaged partners are cordially invited to tour the rustic wedding venue, free of charge. At this event, lovers can break free of the hustle and bustle of city life and enter a peaceful and lovely country environment. Meet Pat and Tom, the gentle giant Ever After Farms Clydesdales. Tour the massive white colored barn that serves as both a blueberry farming facility and can host marriage ceremonies up to 200 persons. Take photos beside a actual Cinderella Carriage. Receive some shade under the gorgeous 120 year oak tree. It’s really an inspirational experience for those that are making the effort to visualize what an ideal rustic barn wedding venue looks like. 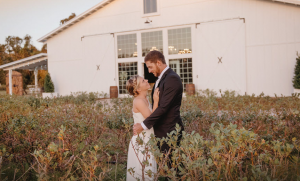 More than simply a Grand Opening as a country wedding barn though, this event will additionally feature a Bridal Expo, in which more than 26 wedding industry vendors will be put in place inside the air-conditioned 7,000 sq ft barn, including bakers, florists, DJs, planners, officiants, and many others. They are going to be delivering information on their services and giving away exclusive prizes to those in attendance. And to get into the spirit of the season, there will even be a snow machine blasting snow over Christmas trees. Even though entry costs nothing, interested lovers will need to register for the occasion on their website. Many individuals have been investing in real estate so if you’re planning to sell your property, you must do it now. The only issue right now is that it’s going to be very challenging to sell a property. You might have seen articles stating that selling a property is quite easy or there are adverts that claim that they can help you sell your house in only a few weeks or months. It is going to be easier to sell a house if you’ll bring the price down, but this will absolutely not be a great idea. In the real estate industry, the supply completely surpasses the demand, but you may find techniques to make your house appealing. We’re going to give you some recommendations to help you with this. Always remember that first impression lasts so your house should provide an excellent impression to the customers once they stop in front of the property. You may put yourself in the shoes of the customer and find out if the curb appeal of your house is good enough to draw in buyers. You have to assess if the house can offer a great impression to prospective customers or it needs some maintenance. The possible buyer will first see the exterior of your house and you need to know that they always pay attention on how the house looks outside. You should prepare everything fix anything that needs fixing. You should make all the required enhancements inside and outside of your house to make sure that the buyers will be attracted to it. They always look for a complete package when they buy a house so you should make repairs. If you are the seller, you should make sure that you could fix everything. Nevertheless, you must not over improve the house since there are some upgrades that won’t really make a huge difference to the asking price of the house. Improvements can enhance the value of your home and its chances to be sold, but you can’t make any upgrades that will not benefit you in any way. You must do your research and put money in the things that can offer the best ROI. Some individuals claim that adding more designs to your home will increase its odds of being sold, but you should understand that personal items, collectibles and art works should be eliminated because they will not really help in selling the house. The best thing to do is to get rid of them all and leave out the essential furniture to make the rooms larger. The goal is to allow the customers to visualize or picture themselves in your house. They will start pointing at every portion of your property while visualizing what they need to place there if they will buy your house so you must make sure that personal items and other unnecessary items will be removed to allow them to imagine. If you’ll sell a home in [LOCATION], you must put a competitive value for your home. If you’ll put a lower value, it will be the same as leaving money on the table and putting a high price will make it unattractive to buyers. If you are referring to home buying, the customers will have a look at the homes which are similar with yours and compare the prices. If your home is too costly for them, they will just ignore your house. You have to remember that most customers are only counting on home financing so they will not be selecting a house that is too costly. If you put a low value, you could sell the house very easily, but your investment won’t be given back to you. You have to understand that it is not easy to sell a house without the help of professionals and it’s going to also be a bad idea to simply do this on your own. You do not have the knowledge and experience to deal with everything so it’ll not be a good suggestion to sell your house without hiring a professional real estate agent. If you’ll try to do this by yourself, there is a big chance that the house won’t be sold or you will not get a good deal for it. You may get fortunate and find a great deal for the house, but selling a property is not about luck because huge money is at stake. You have to think about the help of an agent and permit them to manage everything. Of course, you’ll have to pay them, but it’s much better than acquiring a bad deal. Before you sell your property, you must consider all of these simple guidelines so you will not make any mistakes. The real estate market is extremely complex so you must know anything and everything about this prior to selling your home. Research a city’s laws before buying real estate there. Most cities have an official website. You may find documents on future aspects of city planning. These can really affect the value of your property. Growing cities are usually great investments. Know the local real estate market. Mortgages and rent figures are great for providing insight into home values. Seeing how the neighborhood is maintained can tell you a lot about a property. Learn all of the essentials involving investing in real estate before you throw down a ton of money to buy a piece of property. A mistake in this field can cost you thousands of dollars. Investing in the right type of training is one of the best things you could do. Take a good hard look at the neighborhood before investing in property there. An attractive and desirable neighborhood usually performs well under most market conditions, while depressed areas can be a real challenge. Location is always a high priority, even higher than the properties themselves. If you become a seasoned real estate investor, there are certain to be ups and downs. Do not be discouraged by the bad times you may encounter. If you are persistent, you will succeed. Push forward, learn more, and always keep trying so that you can accomplish your goals. Remember that both gains and losses are inevitable when you invest in real estate. The keys to your success come about when you don’t get too down during the low times. Success will be yours, just stay persistent. You will find success if you don’t give up. Avoid buying a fixer upper. It may seem cheap, but when you calculate the costs of fixing, you may find you’ll lose money. Search for properties where tenants can move in right away, rather than one that needs extensive repairs. The perfect investment is a property that already has tenants. Whether you are looking at buying or selling a property, it is always advisable to work with a very good realtor. Although most of us know at least one person who works as a realtor, don’t be tempted to automatically go to them as they may not be the best to represent your needs. The following two questions are things you need to ask in order to pick the best realtor for your needs. Firstly, you should find out how experienced your realtor is. The more experience they have, the better they are likely to be. The best ones are the ones who started working before the economic crisis and are still going strong. You do have to ensure they have experience that is relevant to your personal needs. Someone who wants to flip properties, for instance, will have very different needs to someone who wants to find a home to raise a family in. You also need to know that your realtor understands your demographic and geographical requirements. For example, if you want to become a rancher, you need to find a realtor that is able to understand the different types of land, how it has been produced and what the homestead is like. Similarly, if you were hoping to purchase a listed or historic property, you will need someone that understands the laws and regulations surrounding those properties. Take note also of some things that should not be done. Don’t choose a realtor that you know as a friend or a relative. This would cause a significant conflict of interest, meaning you will struggle to have an honest business relationship. Also, your relationship could be tainted if things don’t work out. Don’t work with a realtor who has dual responsibility, meaning they represent both you and the other party. Also, if things don’t go the way you want them to, then don’t be afraid to go elsewhere. Of course, do make sure you do this respectfully. Don’t tell realtors that you will definitely work with them unless you are sure yourself. Simply be honest with your realtor and tell them what stage of the process you are at yourself. If you expect your realtor to be honest with you, you need to be truthful to them as well. With the above two tips, you should be able to find the realtor who best represents your needs. The services of real estate agents should be employed whether you are buying or selling. They are able to tell you when the best times are to sell or buy property, and this is vital information to make sure you don’t spent too much, or earn as much as possible. It is always a good idea to enlist the services of a realtor, whether you are buying or selling. You may know someone who works in real estate yourself, but you should still take the time to find the one that is truly the best for your needs. Let’s take a look at two important things to ask in order to find out which realtor is best for you. Your realtor’s experience is one of the most important things to look into. Usually, those with the most experience are also the best ones. The best realtors got into the business before the recent economic crisis and are still working today. However, you also have to make sure that they have experience pertinent to your own needs. After all, if you are looking to move up the property ladder due to family expansion, your needs will be very different than if you were to look for a first home for your college-going child. The second thing you need to know if how much of an expert they are in terms of the geography and demographics you require. For example, if you want to become a rancher, you need to find a realtor that is able to understand the different types of land, how it has been produced and what the homestead is like. If, on the other hand, you want to purchase a listed building or a historic property, you will need someone that has a very different type of experience. It would be a mistake to work with the realtor whome the sellers of a property have already hired if you are looking at making a purchase. This is because that realtor would be legally obligated to tell their other client your highest budget and other information that could damage your negotiation position. If you hope to sell your property, you also shouldn’t work with the realtor representing the opposing side. What you need is a realtor that only works with you. Start by asking people you know whether they can refer you to a realtor. Another place to look for a good realtor is the NAR (National Association of Realtors. If you work with a realtor registered with the NAR, you will know for sure that they are professional and ethical. Always make sure you contact a range of different realtors before making your decision. Explain your needs and ask what they suggest. This will give you a general idea of just how familiar the agent is with prices and neighborhoods, for instance. If you want to sell your home, find out how the realtor has done in the past. Do they usually sell under, on or over the original asking price? It is hoped that you can use the above information to find the right realtor for your needs. A realtor’s job is to help you find your dream home. This is why it is so important to only work with someone that will truly do their best for you. It isn’t as easy as it may seem to buy or sell a home. Yes, we can do most things online now, but it is still recommended to work with a real and good realtor. Let’s explore some of the things you should and shouldn’t do when picking a realtor. Firstly, you should find out how experienced your realtor is. The more experience they have, the better they are likely to be. If you can, try to find a realtor who has worked all the way through the economic crisis and still works now. However, you also have to make sure that they have experience pertinent to your own needs. For instance, the needs of a first time buyer are very different from the needs of a national property developer. The second thing you need to know if how much of an expert they are in terms of the geography and demographics you require. For example, those who want to purchase a ranch will need a realtor that understands soil conditions and production methods and who can also look into the homestead that comes with the ranch. If, on the other hand, you want to purchase a listed building or a historic property, you will need someone that has a very different type of experience. Don’t work with the realtor of the owners of the property you are planning to purchase. This is because that realtor would be legally obligated to tell their other client your highest budget and other information that could damage your negotiation position. The same is true if you are looking at selling. What you need is a realtor that only works with you. Start by asking people you know whether they can refer you to a realtor. You can also contact the NAR (National Association of Realtors) in order to find a professional for you. The greatest benefit of working with a NAR agent is that you know they are both professional and ethical. Always make sure you contact a range of different realtors before making your decision. Make sure they have a great understanding of your needs, so they an start making suggestions too. It is an opportunity for you to find out how much a potential agent knows about neighborhoods, prices and more. If you want to sell a property, you must find out how well the realtor has performed in the past. You need to find out their track record in terms of selling above or below the asking price. If you are selling, you are likely to have to sign an exclusive realtor agreement. It is a very normal thing to do but you still have most of the same rights. For instance, if you are unhappy with the service, you are within your rights to terminate the contract. The contract stops you from enlisting the services of a different agent at the same time, but is otherwise non-restrictive. You are not obliged to sign this type of contract if you want to buy. However, there are now more and more realtors who do request it. Last but not least, you need to understand the way realtors earn their living. Realtors can earn their money in a variety of different ways. Most commonly, they work on commission although there are also some that charge a flat fee. Before you agree to work with a specific realtor, you have to find out which type of payment construction they opt for.